Hutchins began his career with his hometown club Middlesbrough, but was released after only playing for their youth side. He then joined local team Stockton Juniors, where his performances on the wing brought him to the attention of several league clubs. He eventually joined Leicester City but could not break into the first team, making just a handful of appearances. 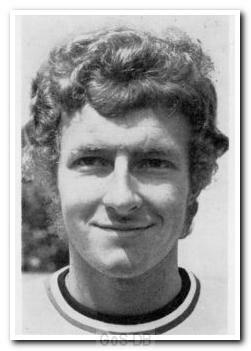 However, whilst playing for Leicester reserves against Argyle he impressed Billy Bingham and shortly afterwards moved to Home Park. Frustrated by the lack of opportunities during his first season with Argyle, Hutchins requested a transfer, and the board agreed. However, when no offers were received he stayed at the club and finally got his chance early in the 1970-71 season. His speed, trickery and crossing ability often had the crowd on their feet and he was also a regular goalscorer. His impressive performances led to a transfer to Blackburn Rovers, where he stayed for two years despite a rumour that he was to return to Argyle, before a move to Bradford City. In seven years with Bradford he made over 250 appearances before a series of injuries led to his retirement. He went on to play non-league football for Scarborough.